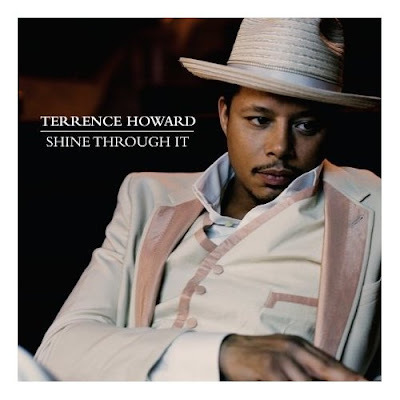 Actor Terrence Howard releases his debut album. An interesting thing happened when I first sat down to listen to Oscar nominated actor Terrence Howard’s debut CD, Shine Through It. Having preferred to play it via iTunes, I accidentally listened to the disc in the reverse track order. Then when I began making notes on certain songs with my instant reactions by “track number,” I realized my mistake and listened again and again — this time in the correct order. Honestly, I think I preferred it the other way around. There’s an awful lot to like about Howard’s album — such as his sheer love of music and passion for arranging, weaving textures through a song one wouldn’t expect by layering on near Broadway styled intros until it grows into something much more delicate. However, there’s an awful lot involved that just doesn’t feel that right about it either. Yet, overall, some of the critics have been less than kind. It's been dubbed “often goofy,” by Blender and the subject of a scathing piece and some pretentious YouTube footage in New York Magazine online titled, “How Bad Is Terrence Howard’s Album Anyway?” As both a listener and fan of Mr. Howard who has enjoyed his work for many years as a film critic, I am relieved to say that it isn’t the disaster that some online news outlets have been labeling it. Experimental is probably the best word to use when trying to describe it. Or, perhaps more pointedly, the album doesn’t quite flow the way most records do, which is probably why I didn’t notice the album order the first time around. Moving from Spanish flamenco to R&B, to 70’s style soft-rock by singer/songwriters (or musical storytellers as I like to call them) to something completely different one minute later, it seems as though Howard was so excited to finally be fulfilling his original passion to become a musician he wanted to work in a little bit of everything including every kitchen sink he’s ever owned. And throughout the course of Shine Through It, that he does which both hinders and helps the uneven album. Howard’s tremendous versatility and range as an actor is his main strength vocally. From sweetly singing the opening track “Love Makes You Beautiful” to becoming far more playful with “Mr. Johnson’s Lawn,” he turns into a suave would-be player on a few tracks before conquering the album’s most superior track, the final, epic “War,” in which he goes from singing to growling within a moment, completely in sync with the driving Broadway-worthy structure. A few other vocal highlights include the pretty “Sanctuary” which the press release noted was inspired by a “chance meeting with Seal and Heidi Klum.” His voice does seem to recall Seal’s at times amidst a breathy female chorus along with the retro Paul Simon and James Taylor-like 70’s sounding “I Remember When,” as he waxes nostalgic about childhood memories. And while the positivity and clever arranging of “Love Makes You Beautiful” and “Shine Through It,” make one forgive the clichéd and hokey lyrics (that do show up here and there throughout the entire disc), I was far more taken in by the largely instrumental tracks “Spanish Love Affair” and “It’s All Game,” which works as a phenomenal showcase for Howard and his co-arranger, Miles Mosley. So in the end, the album is a toss-up and while to The Times, Howard shared his concern that he didn’t “know if… his own people… will hear it right away,” ultimately, I’d say to look beyond race, class, and gender to advise everyone to listen a bit harder and decide which tracks you’re drawn in by yourself, even if it means flipping the track order around in iTunes.